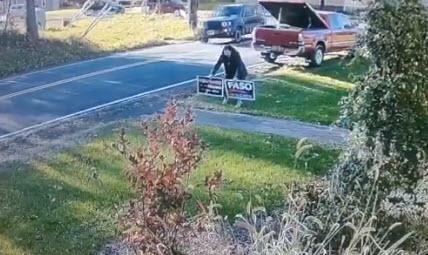 Police arrested a State University of New York professor after she got caught on camera allegedly stealing GOP signs from a New York home’s lawn. A video allegedly showed SUNY New Paltz economics lecturer Laura Ebert stealing yard signs from a New York home supporting Republican candidates in New York during the 2018 midterm election cycle. The Rosendale Town Police Department charged Ebert with a larceny misdemeanor for the theft of the signs, according to the police report obtained by The Washington Free Beacon. The lawn signs supported New York Republican Rep. John Faso for Congress and Marc Molinaro, the New York Republican gubernatorial candidate. “I did it in a moment of weakness and high emotion,” Ebert said in a statement to Campus Reform. “I have apologized and feel bad, but clearly the GOP is putting a big deal [of] spin on this,” she continued. Campus Reform reached out to SUNY New Paltz but the school did not respond in time for publication.